I’ve been reading about how bad sitting is for your health and basically ignored it by saying that I get up enough and I run. Lately there have been even more studies saying that exercise doesn’t help the situation. I still wasn’t convinced. A few months ago, my hip starting hurting and it seemed to be worse when I was sitting, so I thought about a standing desk, but the cost made me put it on my list, but postpone the purchase. About 3 weeks ago, I bought some tall legs for my desk from Ikea and put them on; I was extremely excited about this as I would be able to stand all day. Two things I didn’t consider with this move. First off, standing for a long time hurts my feet and the second is that my son likes to be at my desk sometimes and with the desk so high, he couldn’t sit with me.
. I looked at the specs and was impressed; the cost was reasonable, it had a motor to raise and lower it, and it had a memory to remember the positions. The final piece that convinced me to make the purchase was that I could order just the frame without the top; this shaved some money off the cost and I got to continue use the desk top that has treated me well for years. I ordered the frame from Amazon and it arrived in 2 days; the price was the same as direct from the company, so I figured I’d go with the faster shipping. The box was heavy…74 pounds. I managed to get it downstairs into my office and assembled it all in about 45 minutes in between working. It wasn’t complicated to assemble, but had a lot of steps. When my wife got home, she helped me flip over my old desk and put the desk frame on my top. Attaching the frame to the top was straightforward and quick with the use of an electric drill. After flipping over my desk and setting it into place, I plugged it in and raised it up. The speed was pretty amazing. The rated speed is 1.5″/sec unloaded. My standing position is only about 11 inches higher than my sitting position, so it takes less than 10 seconds to change position. I’ve programmed an up and a down position for it. 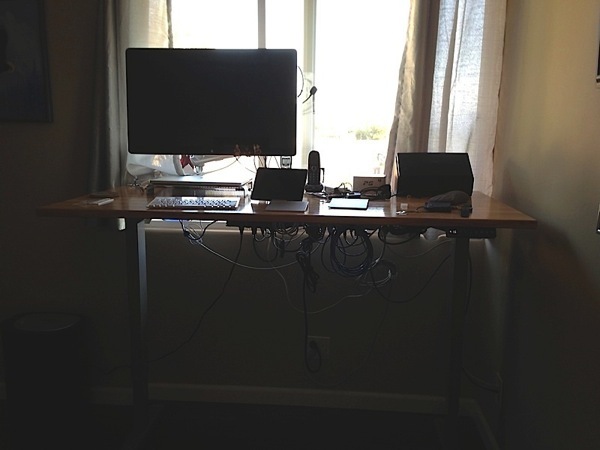 The first week I had the desk, I was standing as much as possible. 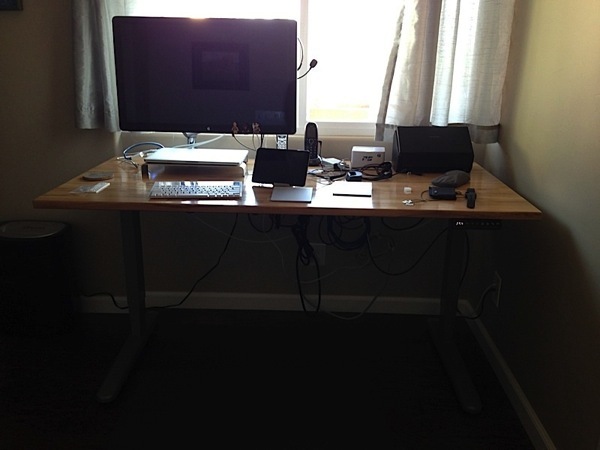 Now that I’ve had it for a bit, I’m finding that I’m alternating between sitting and standing throughout the day. The change is extremely easy. I’ve found that my hip isn’t hurting as much (I’ve combined some stretching with the standing to help) and standing allows me to concentrate more sometimes. While these pictures aren’t great, I’ve attached an up and a down picture. I should have made this purchase a lot sooner; there should be no price tag on my health. I don’t know the quality of the tops that they sell, but the frame was an excellent choice for me. I’m not sure what the more expensive options would have offered me as the concept of the desk is simple; go up and go down. I also picked up an anti-fatigue mat as standing on your feet all day can hurt; I’d definitely recommend a mat to go with this as well. Some people have commented that a desk with two legs as opposed to the four I had previously make the desk less stable; I haven’t found that the case. I have, however, found that my monitor arm makes the screen jiggle a bit when I type. This is minor and is unrelated to the Jarvis Desk. I don’t know the long term reliability of this unit, but I am hopefully that it lasts a long time even with me adjusting it a few times a days. So, it’s been about six months since this review. Still happy with it? I see that IKEA has an adjustable height desk at a good price, so I’m looking into that as well as the Jarvis. It’s interesting that you ask as I mentioned to someone last week that I can’t remember the last time I lowered the desk! I still like the comfort of knowing that I can lower if I want, but I have no inclination to do so. I like the fact that I was able to put my own top on the Jarvis and the memory functions work well. I’d still recommend it. Ok, good to know. I do like that you can put your own top on it and that you can adjust the width, as well. Hey Scott, can you comment on the stability of the desk when raised? I am mainly interested in your opinion of monitor wobble when you are typing. Do you feel any wobble at all? Do you have monitors attached to monitor arms? I have 2 27″ displays on monitor arms attached to the desk. There is definitely a little wiggle on the displays, but I’ve gotten used to it.